Oral cancer is one of the ten most common cancers in the world and grouped together with pharyngeal cancer, it is the sixth most common cancers in the world. An estimated 378,500 new cases of intraoral cancer are diagnosed annually worldwide. In developed countries, oral cancer is less common but is the eighth most common form of cancer overall; however, the ranking varies a great deal among countries. For example, in areas of northern France, oral cancer is the most common form of cancer in men. The prevalence of intraoral cancer appears to be rising in many countries, especially in younger people. The global incidence of lip, oral cavity, and pharyngeal cancers of 529,500, corresponding to 3.8% of all cancer cases, is predicted to rise by 62% to 856,000 cases by 2035 because of changes in demographics. Cancers of the oral cavity and hypopharynx are highly common in Asian countries. One-third of global cases and one-half of oral cancer-related deaths are reported from Southeast Asia. In certain countries, such as Sri Lanka, India, Pakistan, and Bangladesh, oral cancer is the most common cancer. In parts of India, oral cancer can represent more than 50% of all cancers, and it is the most common cancer among male and the third most common among female population, which is related to the deleterious oral habits such as tobacco chewing, betel-quid chewing, tobacco smoking, reverse smoking, as well as other factors such as alcohol consumption, low socioeconomic status, poor hygiene, poor diet, and viral infections, chronic irritation from ill-fitting dentures, rough, or fractured teeth., The most common sites of occurrence of oral squamous cell carcinoma (OSCC) are buccal mucosa and tongue. This retrospective institutional study was conducted with the aim of describing the demographic and clinicopathological profile of cases of OSCC reported at the Oral Pathology Department in Sardar Patel Postgraduate Institute of Dental and Medical Sciences, Lucknow, during a 6-year and 6-month period, to highlight the magnitude of problem and find the trend of the occurrence of OSCC in north Indian population in the state of Uttar Pradesh. In this retrospective study (January 2011 to June 2017), data of 98 OSCC biopsies were retrieved from laboratory records. It included age, gender, risk habits with duration (tobacco and alcohol consumption), any significant previous history, time of delay in diagnosis, site of the lesion and clinical presentation, and histopathological diagnosis. No identifying patient information was disclosed in the study. The study was approved by the Institutional Ethics Committee. Both descriptive and analytical statistics were used for summarization and calculation of the data. Continuous data were summarized as the mean ± standard deviation (SD), and percentage and proportions were calculated for categorical data. Continuous groups were compared by Student's t-test. Categorical groups were compared by Chi-square test (χ2). A two-tailed (α = 2) (P < 0.05) was considered statistically significant. IBM SPSS windows version 21.0 (SPSS Inc, Chicago, USA) was used for analysis of the data. A total of 98 cases of histopathologically confirmed OSCC were reported during the study period and were included in the study. Among the patients, there were 75 (76.53%) male and 23 (23.47%) female patients [Table 1]. The age of the patients ranged from 24 to 90 years mean (± SD) 52.29 ± 13.37 years. Most of the patients were in the age group of 40–60 years (62.24%) in both male (56.00%) and female (82.61%) patients, and it was found to be statistically significant (χ2 P = 0.0281) [Table 2]. The age of male and female patients ranged from 24 to 90 years and 40 to 75 years with mean (±SD) 51.35 ± 14.39 years and 55.35 ± 8.87 years, respectively. The difference in mean age between males and females was not statistically significant (t-test P = 0.211). No significant medical history was obtained from any of the patient records except one male patient of 52 years of age giving a previous history of carcinoma of eyelid, which was successfully treated 4 years back. The data regarding habit history showed the most common habits were tobacco chewing, tobacco smoking, betel quid, and alcohol consumption. About 84.56% of patients had tobacco consumption habits either smokeless or smoked form. 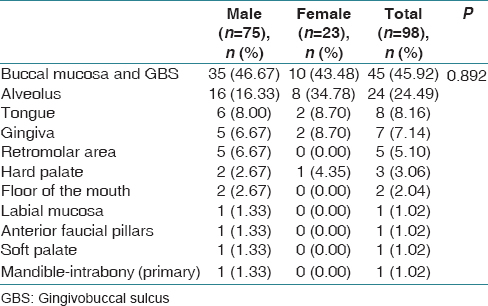 The most common sites of OSCC, in both male and female patients, were found to be buccal mucosa and gingivobuccal sulcus (GBS) (45.92%) and alveolus (24.49%) [Table 3]. However, this occurrence of OSCC at different sites, in males and females, didnot have any statistical significance (χ2 P = 0.892). Only five patients (5.10%) presented with lesions of the white patch while 93 patients (94.90%) presented with ulceroproliferative growth. Most of the cases were well-differentiated OSCC (66.32%), and a small percentage (6.12%) was found to be poorly differentiated OSCC [Table 4]. Histopathological diagnoses as per age are summarized in [Table 5]. There was no statistical significance of the association between age and histopathological category (χ2 P = 0.446). The time of delay in diagnosis varied from 1 week to more than 1 year [Table 6]. OSCC accounts for ~90% of malignant oral lesions and is widely recognized as the most frequently occurring malignant tumor of oral structures, and the mortality rate of OSCC is relatively high, with a 5-year survival rate of 50%. India has the world's highest number (nearly 20%) of oral cancers with an estimated 1% of the population having oral premalignant lesions. In the present study, increased incidence of OSCC was found in males than in females with a male-to-female ratio of 3.26:1, which is consistent with other north Indian studies on oral cancer. Males are more commonly affected compared to females by OSCC in both developed (male: female ratio 2.5:1) and developing (male: female ratio 3:1) countries, which may be due to easy acceptance of habits by males. However, in recent time, this difference in gender distribution is reducing in the developed countries due to more females taking up tobacco-related habits including smoking. Most of the patients were in the age range of 40–60 years, which is consistent with other studies conducted in north India., Oral cancer is usually a disease that occurs in males after the fifth decade of life. The mean age of presentation is in the fifth and sixth decade of life in Asian populations. However, a steady increase in the incidence of OSCC has been observed in patients younger than 40 years. In the present study, OSCC was diagnosed in 16.33% of male patients younger than 40 years. Tobacco consumption is a major risk factor for oral and oropharyngeal SCC. There is a strong association between the use of smokeless tobacco and the risk of development of OSCC. Distinct cultural practices such as betel-quid chewing as well as varying patterns of the use of tobacco and alcohol are prevalent in Asian countries, which are important risk factors that cause oral cancer. The sociocultural norms and values also favor the easy availability of tobacco products. The advent of ready to use tobacco products and aggressive marketing attracts not only youths but also children. In India, the efforts of the Government for deterrence of tobacco products' use prove to be inadequate when looked at the easy availability of the products and their rampant use. In the present study, most of the patients (82.57%) had ≥5 years of tobacco and/or betel-quid chewing habit. Daily frequency and duration of tobacco and/or alcohol consumption have a direct relationship to oral cancer development., A study conducted in Western Uttar Pradesh in India revealed that smokeless tobacco habit (60%) was more prevalent than bidi or cigarette smoking habits (36.26%) in both males and females. Another study conducted in a western city of India concluded that tobacco chewing is the major cause for the development of OSCC. The most common sites of OSCC were buccal mucosa and GBS followed by alveolus, and the findings are consistent with other studies.,, The tongue is considered as the most common site of occurrence of primary OSCCs in the developed countries, but in the developing countries, betel quid and/or tobacco chewing more commonly results in cancer of the buccal mucosa., This is mainly because of prolonged placement of the betel quid in the buccal pouch to obtain a maximum effect as the constituents of betel quid produce a sense of well-being and increased capacity to work by stimulation of parasympathetic nervous system. Similarly, smokeless tobacco tends to incite malignant degeneration at the site of tobacco placement. Tobacco generates carcinogens (cancer-causing chemicals) such as tobacco-specific nitrosamines (e.g., N-nitrosonornicotine, nicotine-derived nitrosamine ketone, N'-nitrosoanatabine, and N-nitrosoanabasine) and free radicals that can impede antioxidant enzymes such as glutathione S-transferase, glutathione reductase, superoxide dismutase, catalase, and glutathione peroxidase. Reactive oxygen species are generated in substantial amounts in the oral cavity during chewing. The time of delay in diagnosis of OSCC in most of the cases (66.32%) was found to be 2–6 months. This can be attributed to various factors such as, but not limited to, patients' negligence due to lack of knowledge and awareness, illiteracy, poverty, and possible resort to home remedies. Professional delay in making a confirmatory diagnosis can also be another factor. The time interval between the onset of symptoms and the start of treatment depends on various factors such as patient's behavior, clinical course of the illness, and the quality of the health services. This study confirms previously established demographic factors such as age, gender, and site distribution for OSCCs in north Indian patients. There are significant associations between OSCC and middle-aged group participants predominantly male. Buccal mucosa and GBS were the most common sites for OSCC. The clinicopathological profile of OSCC patients showed that majority of patients presented with well-differentiated carcinoma. The burden of oral cancer has been increasing in most Asian countries, especially in India; hence, increasing national level public awareness programs all over the country is a demand of the time for prevention, early detection and diagnosis, and to support a tobacco-free environment. When measures taken by Government so far could not deter people from using the tobacco products, whether a blanket ban on their production and sale is possible must be a subject of debate and discussion and of utmost importance to reconsider. Scully C. Cancers of the Oral Mucosa. Medscape; 2016. Available from: http://www.emedicine.medscape.com/article/1075729­overview#a6. [Last accessed on 2017 Jun 23]. Koo K, Barrowman R, McCullough M, Iseli T, Wiesenfeld D. Non-smoking non-drinking elderly females: A clinically distinct subgroup of oral squamous cell carcinoma patients. Int J Oral Maxillofac Surg 2013;42:929-33. Toporcov TN, Znaor A, Zhang ZF, Yu GP, Winn DM, Wei Q, et al. Risk factors for head and neck cancer in young adults: A pooled analysis in the INHANCE consortium. Int J Epidemiol 2015;44:169-85. Beena VT, Binisree SS, Ayswarya T, Paikkadan I, Padmakumar SK, Sivakumar R. Oral squamous cell carcinoma in patients younger than 40 years: A 10 year retrospective study. Int J Sci Stud 2016;4:150-3. Scully C. Oral cancer aetiopathogenesis; past, present and future aspects. Med Oral Patol Oral Cir Bucal 2011;16:e306-11. Ranganathan K, Rooban T, Rao UM. Oral squamous cell carcinoma in patients with and without predisposing habits in glossal and extra-glossal site: An institutional experience in South India. Indian J Cancer 2015;52:625-7. Jin X, Liu D, Zhao X, Zhou Y, Jiang L, Li J, et al. Analysis of clinicopathological characteristics associated with the outcome of oral squamous cell carcinoma and the establishment of tissue microarrays. Oncol Lett 2016;12:3175-82. Singh MP, Kumar V, Agarwal A, Kumar R, Bhatt ML, Misra S, et al. Clinico-epidemiological study of oral squamous cell carcinoma: A tertiary care centre study in North India. J Oral Biol Craniofac Res 2016;6:31-4. Jayasooriya PR, Pitakotuwage TN, Mendis BR, Lombardi T. Descriptive study of 896 oral squamous cell carcinomas from the only university based oral pathology diagnostic service in Sri Lanka. BMC Oral Health 2016;16:1. Sharma P, Saxena S, Aggarwal P. Trends in the epidemiology of oral squamous cell carcinoma in western UP: An institutional study. Indian J Dent Res 2010;21:316-9. Johnson NW, Jayasekara P, Amarasinghe AA. Squamous cell carcinoma and precursor lesions of the oral cavity: Epidemiology and aetiology. Periodontol 2000 2011;57:19-37. Chi AC, Day TA, Neville BW. Oral cavity and oropharyngeal squamous cell carcinoma – An update. CA Cancer J Clin 2015;65:401-21. Krishna A, Singh RK, Singh S, Verma P, Pal US, Tiwari S, et al. Demographic risk factors, affected anatomical sites and clinicopathological profile for oral squamous cell carcinoma in a North Indian population. Asian Pac J Cancer Prev 2014;15:6755-60. Shenoi R, Devrukhkar V, Chaudhuri, Sharma BK, Sapre SB, Chikhale A, et al. Demographic and clinical profile of oral squamous cell carcinoma patients: A retrospective study. Indian J Cancer 2012;49:21-6. Addala L, Pentapati CK, Reddy Thavanati PK, Anjaneyulu V, Sadhnani MD. Risk factor profiles of head and neck cancer patients of Andhra Pradesh, India. Indian J Cancer 2012;49:215-9. Madani AH, Dikshit M, Bhaduri D, Jahromi AS, Aghamolaei T. Relationship between selected socio-demographic factors and cancer of oral cavity – A case control study. Cancer Inform 2010;9:163-8. Mehrotra R, Yadav S. Oral squamous cell carcinoma: Etiology, pathogenesis and prognostic value of genomic alterations. Indian J Cancer 2006;43:60-6. Ayaz B, Saleem K, Azim W, Shaikh A. A clinicopathological study of oral cancers. Biomedica 2011;27:29-32. Udeabor SE, Rana M, Wegener G, Gellrich NC, Eckardt AM. Squamous cell carcinoma of the oral cavity and the oropharynx in patients less than 40 years of age: A 20-year analysis. Head Neck Oncol 2012;4:28. Kerdpon D, Sriplung H. Factors related to delay in diagnosis of oral squamous cell carcinoma in Southern Thailand. Oral Oncol 2001;37:127-31.